The EGFR family of membrane receptors consists of four different proteins called EGFR/ErbB1/HER1, ErbB2/HER2, ErbB3/HER3, and ErbB4/HER4. Under normal physiological conditions, the ErbB receptors play crucial roles in propagating signals regulating cell proliferation, differentiation, motility, and apoptosis. EGF receptor family shows clear differences between individual receptors, and also a large overlap. ErbB1 is the family member with most interaction partners and the highest percentage of tyrosine residues with more than one binding partner. ErbB3 is characterized by a large number of binding sites for phosphatidylinositol-3-kinase (PI3K), while ErbB2 has only few interaction partners with Shc as the most frequent one. ErbB1 and ErbB4 have a variety of phosphotyrosines that bind Grb2, or Grb2 and Shc. The ErbB1 and ErbB4 have a greater diversity of interaction partners than ErbB2 and ErbB3. ErbB1 and ErbB2 are often over-expressed or amplified in cancers, making them important targets for drugs currently in use or under development. With the RayBio® Human EGFR Phosphorylation Antibody Array 1, researchers can now simultaneously detect the relative level of phosphorylation of 17 different specific sites for Human EGFR family in cell lysate. By monitoring the changes in protein phosphorylation in your experimental model system, you can verify pathway activation in your cell lines without spending excess time and effort in performing an analysis of immunoprecipitation and/or Western Blot. Work reliably with wide range of cell lines and high sensitivity. By using the RayBio® Human EGF Phosphorylation Antibody Array 1, treated or untreated cell lysate is added into antibody array membranes. The antibody array membranes are washed and cocktail of biotin-congujated anti-EGFR is used to detect phosphorylated EGFR on activated receptors. After incubation with HRP-streptavidin, the signals are visualized by chemiluminescence. Fig. 1. Human epidermoid carcinoma cell line, A431 cells that were 80-90% confluent were serum starved overnight, then exposed to 100 ng/ml EGF for 20 minutes at 37 °C. Control cells were serum starved without the subsequent stimulation with EGF. Cell lysates were prepared following the "Preparation of Sample" portion of our protocol V. To use the RayBio® Human EGF Phosphorylation Antibody Array 1, treated or untreated cell lysate was added into antibody array membrane. 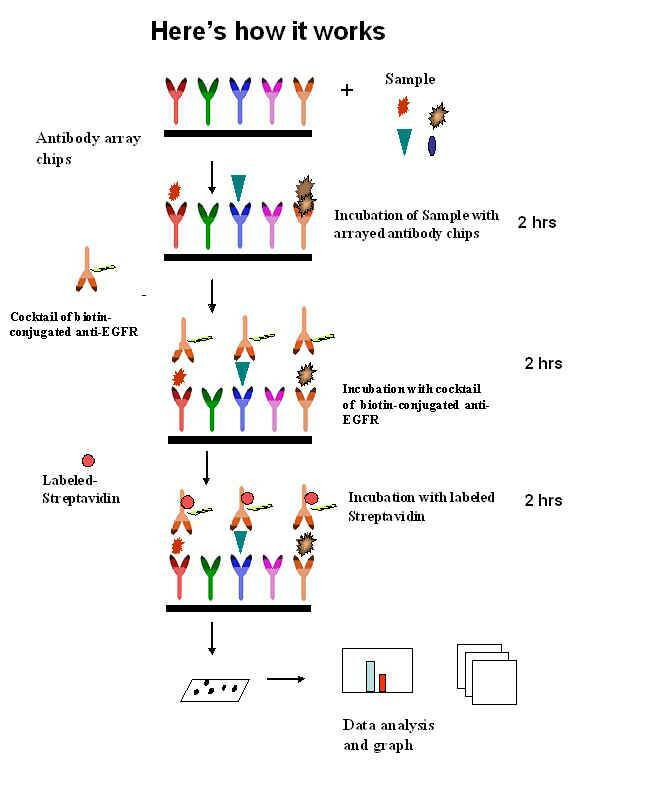 The antibody array membranes were washed and cocktail of biotinylated anti-EGFR was used to detect phosphorylated proteins on activated receptors. After incubation with HRP-Conjugated Streptavidin, the signals were visualized by chemiluminescence. Fig. 2. Western blot analysis of extracts from 100 ng/ml hEGF treated A431 cells and untreated A431 cells. Phospho-EGFR (Tyr845) or Phospho- EGFR (Tyr1173) antibodies was used in this assay. Zhang J, Ji J-Y, Yu M, Overholtzer M, et al. (2009). YAP-dependent induction of amphiregulin identifies a non-cell-autonomous component of the Hippo pathway. Nature Cell Biol. 11:1444-1450. Normanno N, De Luca A, Bianco C, Strizzi L, et al. Epidermal growth factor receptor (EGFR) signaling in cancer. Gene. 2006:366(1):2-16. Huang RP, Huang R, Fan Y, and Lin Y (2001). A novel method for high- throughput protein profiling from conditioned media and patient’s sera.. Ana. Biochem. 294(1):55-62.